Elvis settled in remarkably well, given that I've never had a steer before. An intensely social creature, he reminds me a bit of Shrek: All he wants, besides grass, is love and attention, yet everyone flees at his approach. Which is understandable. Whenever someone opens the gate, no matter where in the pasture Elvis is, he comes thundering down the slope toward his visitor. It's a true test of nerves. Elvis weighs nearly 2,300 pounds: It isn't easy for him to slow or stop. He leaves skid marks. I've taught him to "stay" (more or less) when I approach, but once or twice he's gotten overexcited, swung his huge head, and sent me sprawling. He shows remorse, leaning over to lick me with his enormous, drooly tongue, like a two-story Newfoundland. Several times a day, he came up to the pasture gate—now electrified like a state prison's—to get closer to the donkeys and the sheep. Except for the baby donkey Jesus, who was willing to check Elvis out from the other side of the fence, they would all quickly scuttle as far away as they could get. And as fond as I was of Elvis, I didn't really want him strolling around the farm trying to make friends. He could (and did) walk through any unelectrified fence I had, practically without noticing. He would wreak havoc if he wandered into the hamlet near my farm. Elvis would think nothing of putting his head through a kitchen window if he smelled something good to eat. And he was more than a match for the muscle cars and juiced-up pickups that roared around my farm. Elvis was lacking in social graces. While getting scratched, he might suddenly drop an enormous cowpie that landed like a giant boulder on the ground. Or unleash a prodigious whiz that trickled down to the road. He didn't eat hay so much as inhale entire bales. He didn't really know how to play well with animals of normal size. A few times, I'd tried bringing the donkeys and the sheep into the paddock with him. He appeared delighted to have company, but when he galloped into their midst, the sheep fled and the donkeys hid behind trees. He looked disappointed. Sometimes I would hear Elvis' lowing early in the morning or late at night, and it seemed as though he were calling out to something. When I went out to see, he came skidding down the hill, as I dove out of the way. A few months ago, I got a telephone call from Annie's best friend, Nicki. She and her husband owned a beautiful farm just outside the hamlet, where her small herd of cows and horses were fed the best hay and grain and sheltered in warm, spotless barns. Now Nicki's husband was being transferred, and they had to move. Amid the chaos and tears, she was frantic to find good homes for her animals, particularly her favorite cow, Luna, a brown and white mixed-breed 3-year-old. Nicki didn't want to send Luna to a dairy farm. She wanted her to live where she could graze freely and continue to get special grain treats, and where some idiot would feed her forever. Naturally, I agreed. I called farmer Pete Hanks, who'd sold me Elvis, and asked if he could transport Luna in his livestock trailer. He and his brother Dean and Annie drove over to Nicki's to drop off the trailer and see whether Luna (a slip of a lass at 900 pounds) would agree to climb aboard. As it happened, when Nicki brought out a tub of grain, Luna hopped onto the trailer without two seconds' hesitation. Nicki said a tearful goodbye, and the entire entourage drove to my place (including Nicki, who wanted to say another farewell to Luna). My wife, a committed New Yorker, watched and muttered about the odd turns life with her husband took. ("It's like being married to a runaway train," she grumbled bitterly.) And I stood, trying to recall precisely what I was thinking when I agreed to this expanding menagerie. Then, I was suddenly reminded of one my favorite childhood movies, Bride of Frankenstein. Elvis' head came up as soon as he saw the trailer and heard Luna's moo. Hers was a guttural alto bray; his was deeper. He began to dance around. A friend like me! Maybe a girlfriend! The two animals started talking to each other right away. Elvis' dancing around the pasture was a sobering sight, causing woodchucks to dive into holes, the sparrows to flee the barn, and all the humans to back up quickly. I went over and tapped him on the nose, saying, "Yo, dude, chill." He backed up a bit, and we swung the gate open. Luna, with no coercion of any sort, trotted down off the trailer into the pasture. Elvis was beside himself with joy. 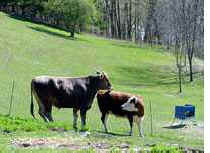 He sniffed Luna, and then the two of them took off, frisking around the pasture. 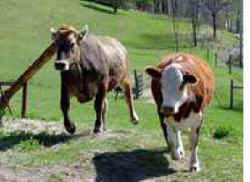 I'm not sure what a happy pair of cows ought to look like, exactly, but these two seemed quite pleased to meet. Elvis literally kicked up his heels. His manners improved. He was disarmingly sweet. When the good green hay—second cut—was brought out, he let Luna get the first chomp before shoulder-butting her halfway across the meadow. When it was time for grain, he stood at one end of the trough, she at the other until their heads and noses met in the middle. From the first day, they were inseparable. Elvis towers over Luna, but now we never see one without the other close by. At night, they go off to sleep under an apple tree, Luna sometimes resting her head on Elvis' monstrous back. In the morning, I see the two of them at the top of the hill, taking in the view.